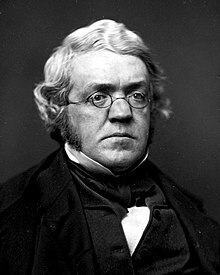 William Makepeace Thackeray (1811-1863) was an English writer. He is most famous for his novel, Vanity Fair. The title is from a place in Pilgrim's Progress. The novel is about the adventures of Becky Sharp, an ambitious girl who wishes to rise in English society. This page was last changed on 4 June 2013, at 17:17.